"The Machpela House was purchased a few years ago, but the Israeli government disgracefully prevents families from living in homes they have purchased for more than five years without any moral or legal justification," the families said in a statement. "In these days of Jewish bloodshed, bereavement and Israeli government posturing vis-a-vis our enemies, we call upon the government to vigorously raise the banner of settlement and loyalty to the Land of Israel," said the families. Security forces arrived at the scene, but it is not clear whether they intend to evacuate the house. 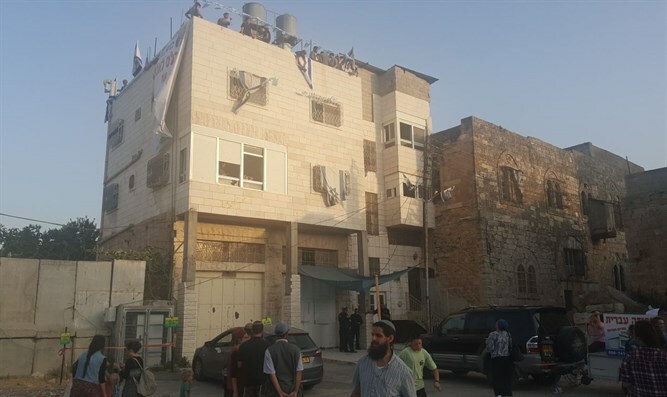 Two-and-a-half weeks ago, security forces prevented Jews from resettling Machpela House and the "Rachel and Leah House" in Hevron, purchased by Jews several years ago. The entry attempt was made following UNESCO's decision declaring the Tomb of the Patriarchs and Hevron to be exclusively Muslim holy sites, and after the Military Appeals Committee decided to order the Initial Registrations Committee to renew registration procedures for the Jewish purchasers after they were stopped a year-and-a-half ago. The Appeals Committee decision determined that the Initial Registrations Committee ostensibly ignored documents that appeared to be originals or documents that appeared to be certified as notarized and that were in the registration file submitted to the Initial Registrations Committee. The Committee noted another series of errors in the Initial Registrations Committee to close the registration file, inter alia, on questions of the validity of power of attorney and the status of urban lands, such as the land on which the houses in Hevron are built. Committee member Prof. Haim Zandberg determined, with the agreement of the other two committee members, that the registration file should be returned to the Initial Registrations Committee in order to reexamine all the documents in the file and decide whether the house could be registered in the name of the Jewish purchasers.